Welcome to the most fun to play Video Poker to date. made super playable by the excellent multi touch controls and the adjustable card deal speed. if not billions/trillions or even quadrillions of credits. 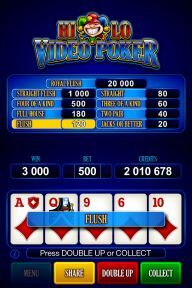 Hi-Lo Video Poker will provide countless hours of fun entertainment on Android, Apple and Windows devices. The game is a standard Jacks or Better Video Poker game. You get dealt a hand of five cards in which you can hold/discard any of the five cards. Upon drawing you will receive your final hand. You win with any combination equal to or higher then a pair of jacks. Any win can be gambled, which activates the super fun Hi-Low Double Up gamble. In this gamble, you are presented with a card, and the option to bet higher or lower. Bet right and you double your win. Bet wrong, and you lose it all! - Uncontrolled and fully random Video Poker. - Auto Hold option (to make it easier to reach that awesome gamble). - Auto Gamble option (to prevent accidental collecting). - Higher/Lower Double Up gamble. - Tons of buyable power ups, where you can spend the millions of credits made in the gamble. - The ability to change a card once in the gamble. - Mega gamble that is uncontrolled and runs fully random. - Ultra gamble that can be leveled up for an even higher win chance in the gamble. - Use Jokers to help you pass tough gambles without the risk of losing. - Over one hundred Achievements. - Poker and Gamble Statistics. - Hours and hours of ridiculous play fun, try doubling up that win into QUADRILLIONS of credits.